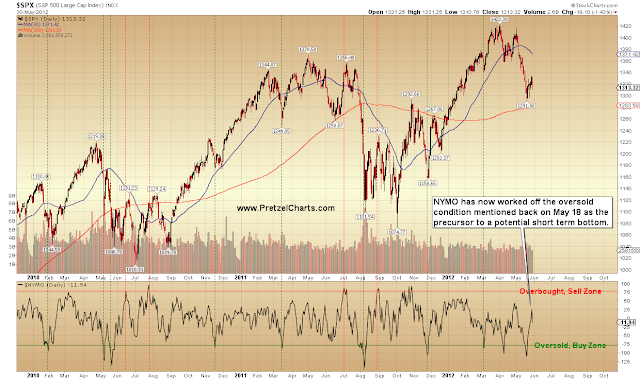 It appears likely that the upward correction is now over. 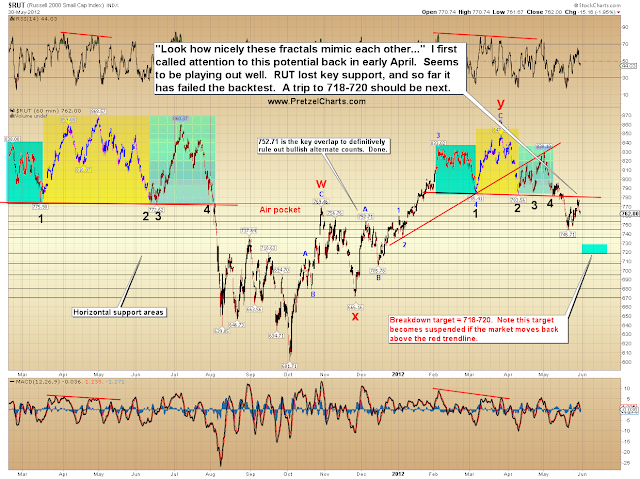 The fractal is complete, which favors the odds that the correction is also complete. There is, of course, no rule to prevent the correction from tacking on another fractal in order to stretch itself out further -- but it makes sense to assume the higher probability outcome (which is: the correction is over, in case you drifted off). Even if the correction does go against the odds here and manage to make another new swing high, as I stated yesterday, it is almost certain that the entire structure since the SPX low of 1292 is a correction to the larger trend, which is now down -- and therefore this rally should ultimately be fully retraced. 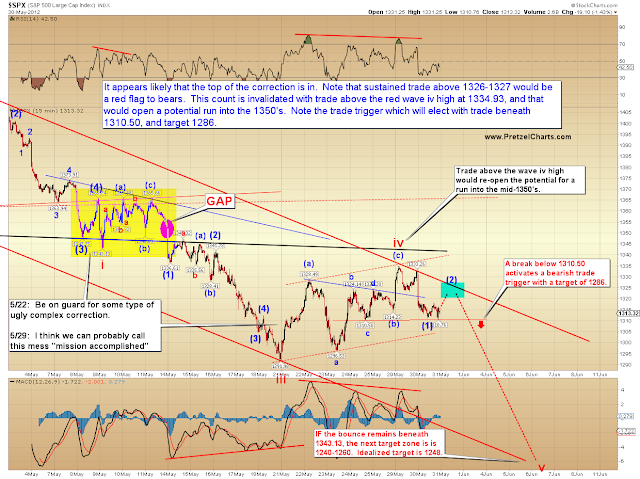 The market remains in a dangerous position. The odds that we've seen a major top with the April print high of 1422 (S&P 500) will increase if and when the market makes new lows, which I'm currently anticipating it will. 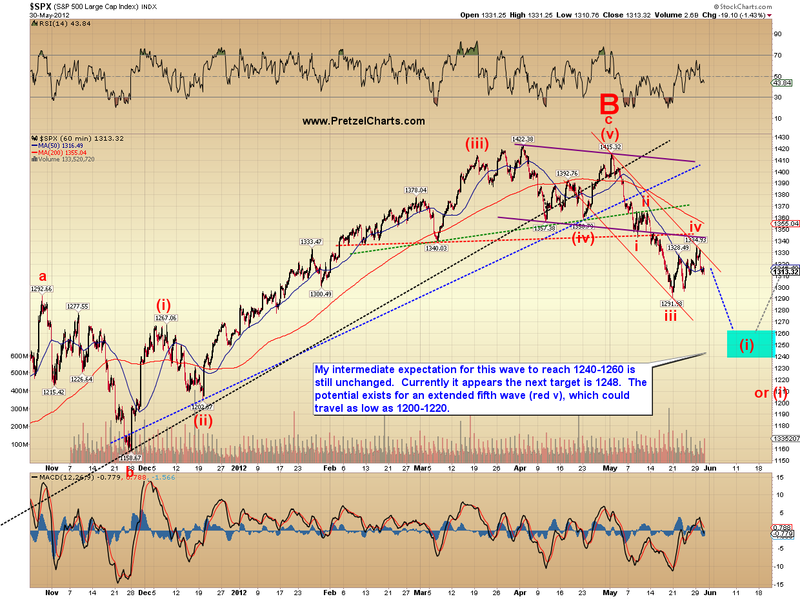 If my overall big picture view is correct, then the entire rally since 2009 will eventually and ultimately be retraced. The first chart examines the McClellan Oscillator, which has now worked off the oversold condition that I mentioned on May 17 (as a possible prelude to a bounce). You may be starting to see why I like this indicator -- I also mentioned it the exact day the market bottomed back in April. In any case, the indicator is back to a neutral condition, which -- while not a guarantee that the correction is over -- does give the green light for another leg down to commence. The next chart is the intermediate term outlook for the S&P 500 (SPX). 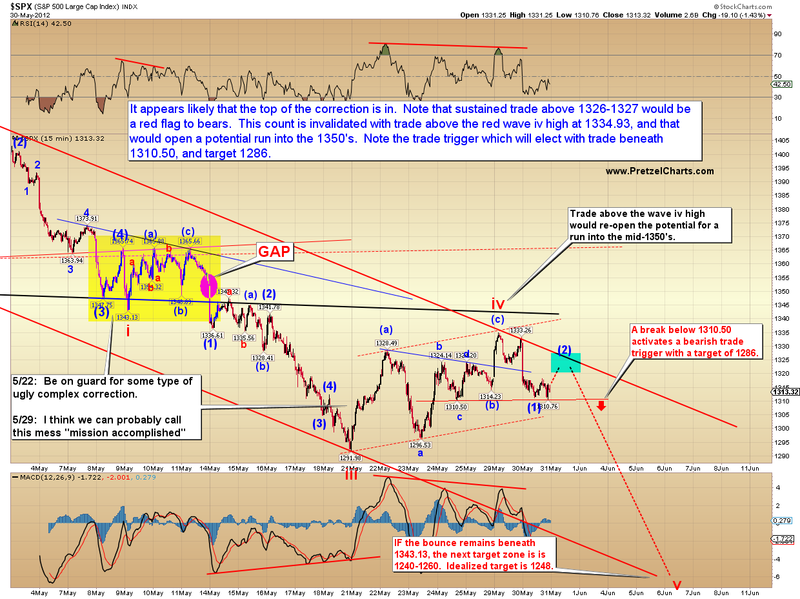 I still anticipate a trip to the mid-1200's, at the minimum, for this leg down. 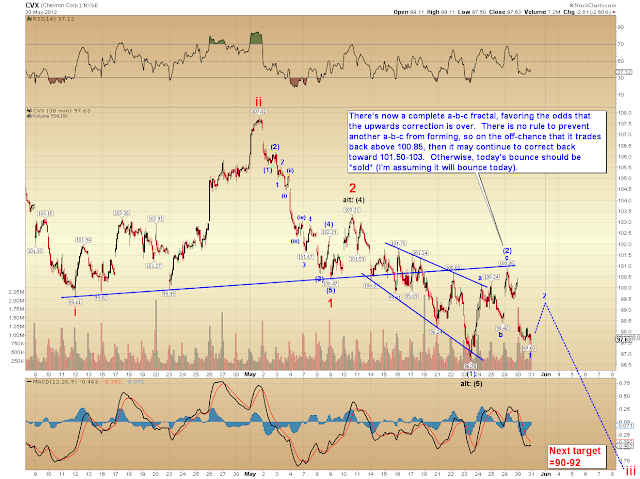 Again, note that this would only be the first leg of at least 5 legs lower (if you're new to Elliott Wave Theory, it might help to familiarize yourself with it through this article). The next chart shows the Russell 2000 (RUT) which has now completed (and failed) a backtest of the head and shoulders top pattern. 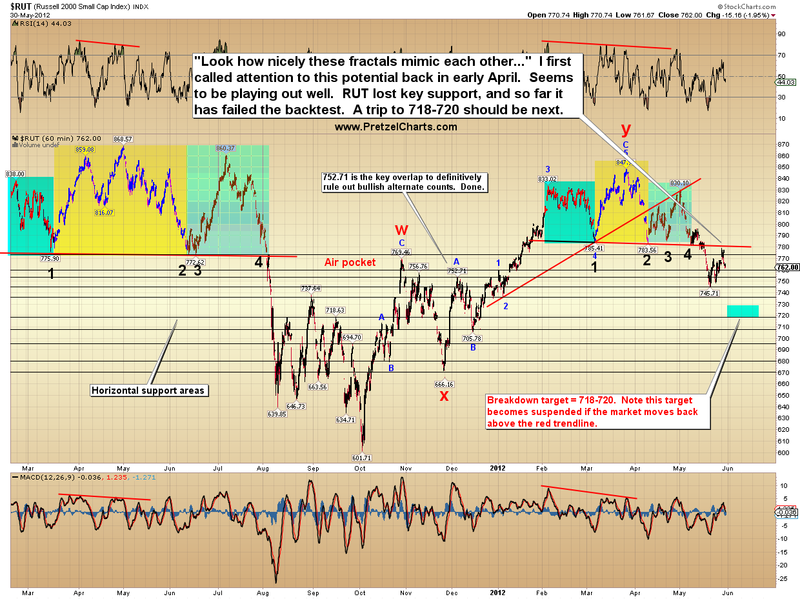 Next, the short-term SPX chart, which suggests a small snap-back rally may be in the cards for Thursday. 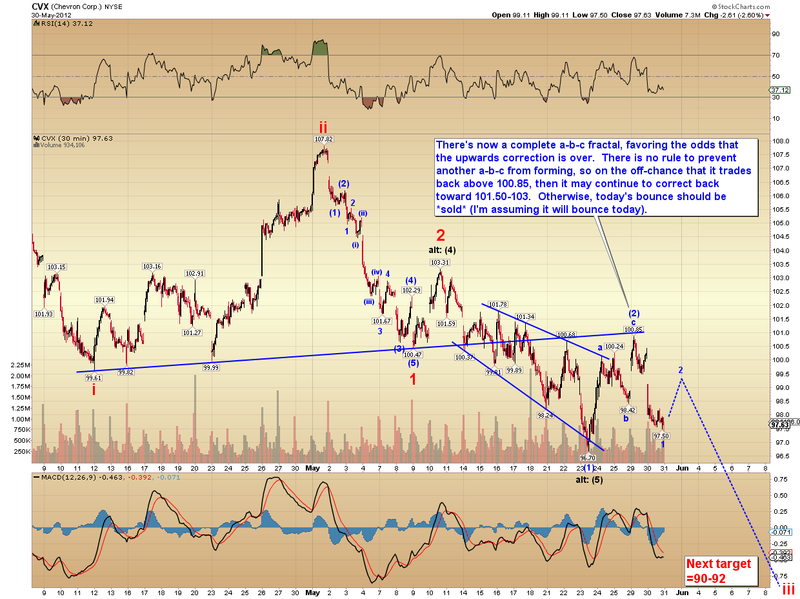 And finally, a quick update to Chevron (CVX) which also appears to have started the next wave down. In conclusion, most snap-back rallies thus far have fallen short of their expected targets, so it remains to be seen if Thursday will be an exception and actually reach the target zone. In either case, it appears highly likely that the corrective rally is over, and new lows are on deck. Trade safe. The comments section has moved! Hi PL. I signed up on this forum a couple of weeks ago just prior to your transition to the new forum. I just created a new account at Deep Wave Analytics as thundercloud9. Please activate my account when you get a chance. Thanks! Hi PL. I'd like to migrate over to your new place of employment if you deem me worthy. My handle on the new forum is BenedictArnold. I have posted on this site a few times so my email should show up in your database. Love your work and hope to continue to be able to use you as a mentor for my EW education.